These were questions Andrew Wailes wrestled with in spite of being raised in a strong Christian home. Once he went off to college, he found himself in a whole new plateau of thinking—and questioning. His breaking point came while a student at a Christian University. “I always felt people weren’t telling me the whole story,” Andrew shared, and those feelings led to doubts. He hoped that at a Christian University he’d find the answers he was searching for, but even there he found disappointment. When Andrew had intellectual questions, he felt they were answered with sterile and unsatisfying responses to just pray or have more faith. But none of those worked for him, and in his Sophomore year, Andrew checked out. Before I tell you what happened to Andrew, let me introduce you to an organization that seeks to help those who may be in a similar place. Enter, Ratio Christi, a global movement that is not afraid to marry faith and reason. Ratio Christi is Latin for “the reason of Christ” and embodies chapters globally, as well as a local one that meets weekly at Wright State University. “But sanctify Christ as **Lord** in your hearts, _[righteousness]_ always being ready to make a **defense** _[rational]_ for the hope that is in you, yet with **gentleness and reverence** _[relational];_ and keep a **good conscience** _[righteousness]_ so that in the thing in which you were slandered, those who revile **your good behavior in Christ** _[righteousness]_ will be put to shame." One could say Ratio Christi unapologetically trains students in Apologetics (I apologize for the play on words). This past fall, Ratio Christi brought in Frank Turek, author of I Don’t Have Enough Faith To Be An Atheist. Two hundred people were in attendance for the two night event. They also hosted a Q&A time after taking students to see “God’s Not Dead” movie that released in theaters. The result? People connecting and re-connecting with their faith and the reason for the hope within them. God was moving in hearts and lives. Ratio Christi meets weekly on campus at WSU and is open to the community. 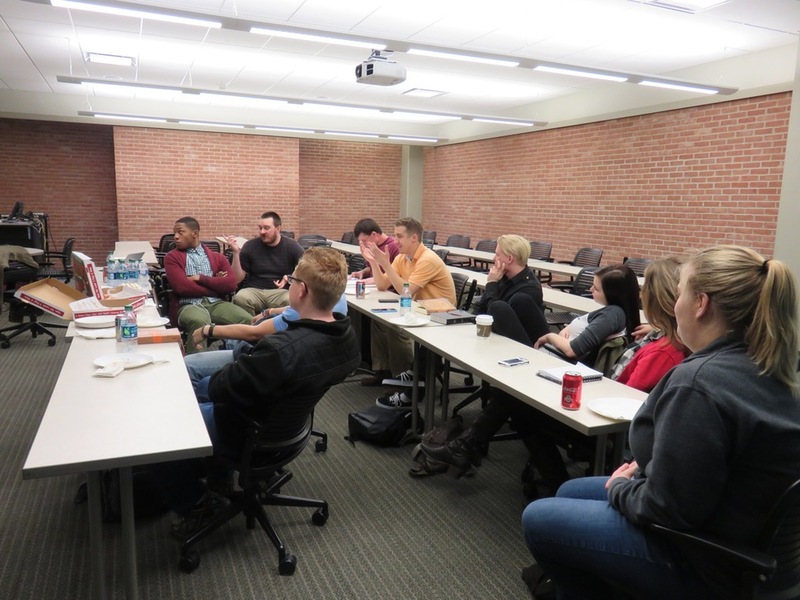 Last semester they addressed such topics as “Who is the real Jesus?” and “Is the Bible Reliable?” A typical meeting could involve pizza and discussion – and always food for thought. Although a student-focused ministry, Andrew shared it is not uncommon to even have empty nesters join in the meetings--all are welcome. But wait, where does Andrew come into this picture? He is the current Director of the WSU chapter of Ratio Christi. And now, the back story: While in his Sophomore year at the Christian University he was attending, Andrew walked away from his faith. “I came back to the Lord my Junior year, but not deeply.” It was then he joined an accountability group to help him wrestle through his doubts and was introduced to Greg Koukl’s book, “Tactics” and an organization called Stand to Reason ([www.str.org](http://www.str.org)). A whole new world of apologetics opened before Andrew and resonated deeply within his heart. “After reading Koukl’s book, a few weeks later I was playing an online game that didn’t need my full attention, and decided to listen to one of his podcasts. He was debating an atheist, and I was fascinated by what he was saying. He seemed to have answers; real answers,” Andrew recounted. It was like water to his thirsty soul. Through a house church connection, Andrew was then introduced to Dave Nedostup, the director of the WSU chapter of Ratio Christi. He began attending the group, and was later invited to help teach a few lessons. When Dave had life changes that resulted in his need to step down a little over a year ago, Andrew then stepped into his shoes as director over the WSU chapter. “My greatest delight is to see that what we’ve done has made a difference in someone’s life,” Andrew shared with me. Having pursued a Master’s degree in Apologetics through Biola, Andrew’s desire is to provide for others what his own soul had been longing for: a faith that could stand to reason.